Agri Labour Australia delivers casual, short-term and permanent farm work candidates to agribusinesses across the agriculture-rich regions of New South Wales. If you're looking for NSW farm jobs or regional agricultural work, our experienced team can find you a position using our extensive digital reach and long-standing traditional networks. No matter what time of the year you require agricultural employment in NSW, Agri Labour Australia always needs people for various farm labour projects across the New South Wales harvest calendar. Unskilled and skilled farm workers are invited to apply for farm jobs across a range of commodities. Our team has extensive experience delivering workforce solutions for winter and summer field crops (including forage and fodder crops), with pastures that extend from Queensland and follow the farm work season down to New South Wales. 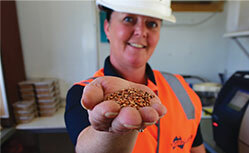 Generally speaking, Queensland crops come into season earlier because the weather is warmer. This allows Agri Labour Australia to immediately mobilise reliable workforces from Queensland to secure agricultural employment NSW. 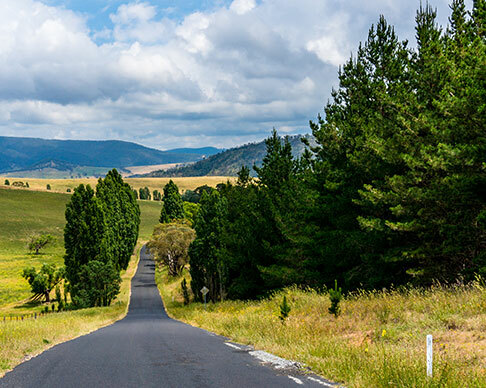 Having no gap between Queensland and NSW farm jobs allows us to retain skilled workers who may otherwise disperse to look for alternative employment. Our NSW agricultural employment opportunities aren’t limited to farm jobs in the country – we also provide reliable workforces for New South Wales’ metropolitan and regional agribusinesses in Sydney, Newcastle, Orange, Wagga Wagga, Wollongong, Tamworth, Bathurst, Port Macquarie and Dubbo. 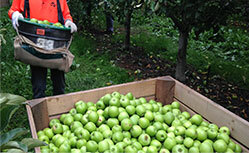 From the Tweed in the north through to Tumbarumba in the south, Agri Labour Australia sources various types of farm workers to handle processing, production and packing for fruits and vegetables throughout the state. 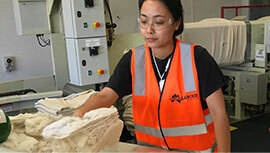 Direct from Queensland, Agri Labour Australia also assembles crews of farm workers to fill positions in the grain, broadacre farming (cotton, cereals, oilseeds and pulses) and cotton gin industries, which are concentrated around the inland regions of Northern NSW. 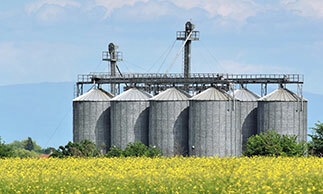 On the north-east coast of NSW and in the north-western area of the state, we work with a number of well-known agricultural clients in the nut industry (both on the harvesting and processing side). 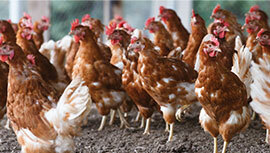 Poultry businesses are an important part of our client base in Queensland and New South Wales. Throughout NSW, we assist egg and meat-producing clients with finding suitable candidates for both short and long-term farm labour roles. 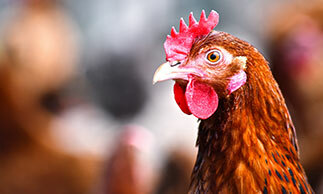 As well as animal husbandry, veterinarian, general farm worker, machinery operation and management roles, our recruitment specialists assist with the construction of various agriculture operations (for example, poultry facility installations). New South Wales’ farms supply a large proportion of Australia’s fruit and vegetables, and they all need reliable farm workers at different times of the year. For instance, apples are a major crop that grows prolifically in parts of NSW. 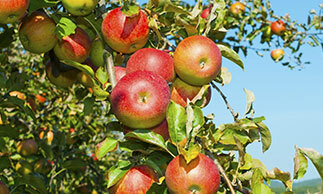 Generally a cold climate fruit, most NSW apples are grown around Batlow and Orange. 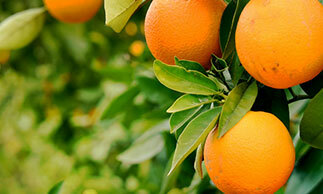 Limited varieties are also grown in Forbes, the Sydney basin and the Northern Tablelands. Pears and nashi are also grown in NSW on a much smaller scale. 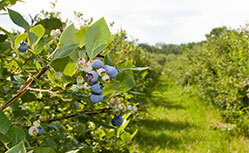 Another important crop in NSW is berries. Principally grown in the northern, central and southern tablelands, as well as the mid-north coastal regions, berries are a vital commodity and picking requires specialised training. Agri Labour Australia regularly assembles and trains teams of farm workers to handle the delicate fruit and ensure production runs smoothly. A variety of seasonal stone fruits are also grown in NSW, including cherries, peaches, nectarines, plums, apricots and prunes. 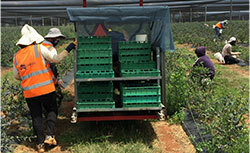 Agri Labour Australia supplies workforces for both temperate and low-chill stone fruit producers. 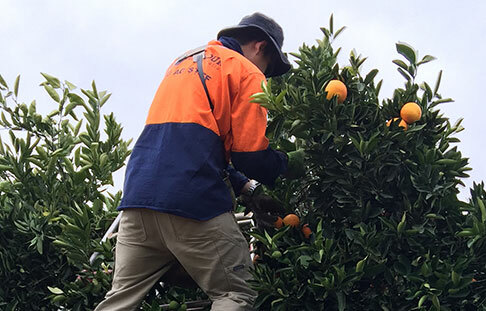 With a production area of around 13,000 hectares, another key New South Wales crop Agri Labour Australia delivers workforces for is citrus fruits. The Australian citrus industry is crucial to our economy in terms of exports because it is worth more than $200 million annually. You can see why this commodity creates so many farm worker jobs in New South Wales because the state produces around 250,000 tonnes of fruit every year. 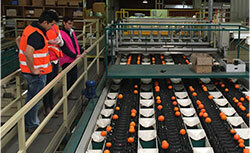 This represents 40 per cent of total Australian citrus production and 36 per cent of citrus exports. Agri Labour Australia works with wine-maker clients across New South Wales to supply multi-faceted workforces. 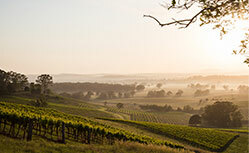 With 16 wine regions, NSW is the state with the most diverse wine-production climate and terroir in Australia. Not many people realise that New South Wales produces around 500,000 tonnes or 30 per cent of the Australian wine crush. Our recruitment specialists regularly staff cool-climate vineyards in southern NSW (the Riverina) – which is New South Wales’ largest production region and is home to more than half of the state’s grapes – as well as wineries in the New England and Upper Hunter regions further north. To support wine grape growers, Agri Labour Australia finds reliable staff across all of the state’s wine regions, which include the Canberra District, Cowra, Gundagai, Hastings River, Hilltops, the Hunter Valley, Mudgee, New England, Orange, Perricoota, Riverina, Shoalhaven Coast, Southern Highlands and Tumbarumba. Whether you’re a client or a candidate, Agri Labour Australia has the networks you need to find farm work in New South Wales or staff your operation with reliable workers.